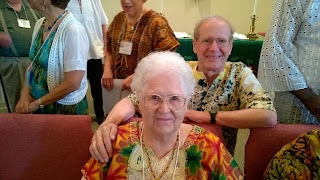 My wife and I traveled from Oregon to the biannual reunion of Servants of Sierra Leone (SOSL), held last week (August, 2016) in the Brooks-Howell Home, Asheville, North Carolina. It was grand to greet old friends and make new ones. My main goal was to thank old friends, African and American, for their help and support half a century ago in my young adulthood through hosting and guiding me in Sierra Leone. These two visits, 1961 and 1968-69, created in me the deep sense that Sierra Leone is my second country. Since 1968 I've visited Africa several times in venues from Cape to Cairo. But my two visits to Sierra Leone have had by far the greatest impact on me. The Rev. Clyde Galow, a resident of the city of Bo, Sierra Leone in 1961 and the director of the Evangelical United Brethren mission there, guided me to life-changing experiences from Freetown on the Atlantic shore all the way to the highlands in the east. (Click here for country overview and map.) He took a deep interest in making sure that I was presented African views, not only expatriate perspectives, during my stay. Clyde served in that role again in 1968-69 for my spouse and me. It was wonderful to hug Clyde. I thanked him for his influence on me. I thrilled--I think that's the best word here--to attend the Christian Eucharist over which Clyde and Bishop Yambasu presided, with great presence. In 1960-61 Clyde steered me to home stays with the Bradford family, the Thomas family, and with several others. He gave me an introduction to an important big man, the Rev. 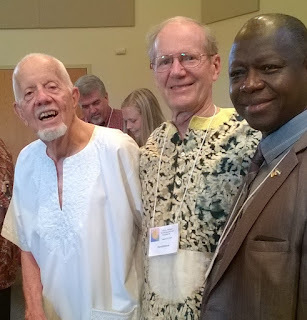 Dr. "Pa" Renner, pastor of King Memorial Church, Freetown. Dr. Renner graciously spent time informing me--entertaining me, too. He helped my wife and me in a tricky situation in 1969. You can read about many other gracious hosts and hostesses right on this blog-site (click here) and I hope you will. Esther Megill, who pursued a medical career in Sierra Leone, now resides in Brooks-Howell home. In 1960-61 and 1968-69, Esther entertained me in Rotifunk Sierra Leone. Years later she helped me to access the University of Ghana in Accra. In sum, many world travelers including Ibn Khaldun and a host of others to this very day have learned more about themselves and the purpose of their lives through travel. Self-discovery could be a function of discovery of others and the Other. Something like that is what I experienced and I encourage you to travel with self-discovery in mind as a goal. I ask you to find a way to help people in the current generation to self-discovery experiences. Parents, grandparents, aunts and uncles, coaches and teachers are uniquely positioned to help kids discover themselves to and through the grand tours of their youthful years. Earlier in life, school friends and a pastor tried to squeeze me into the fundamentalist mold. Instead, I've learned that I am on a continuous seeker journey, intent on understanding others' psyches, belief systems and cultures in order to understand my own. This is my story and this is my song: exploring the other, the Other, and myself all my life long. I wish you the very best on your own journey.